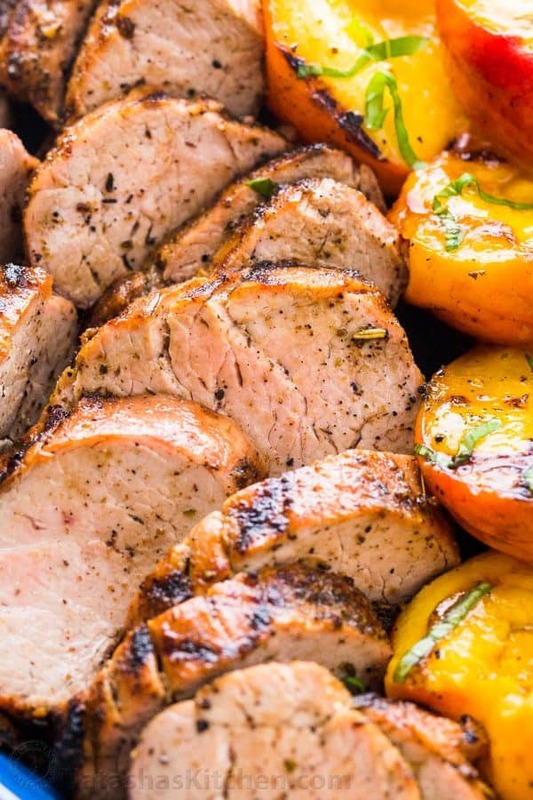 Grilled Pork Tenderloin is juicy, tender and delicious! 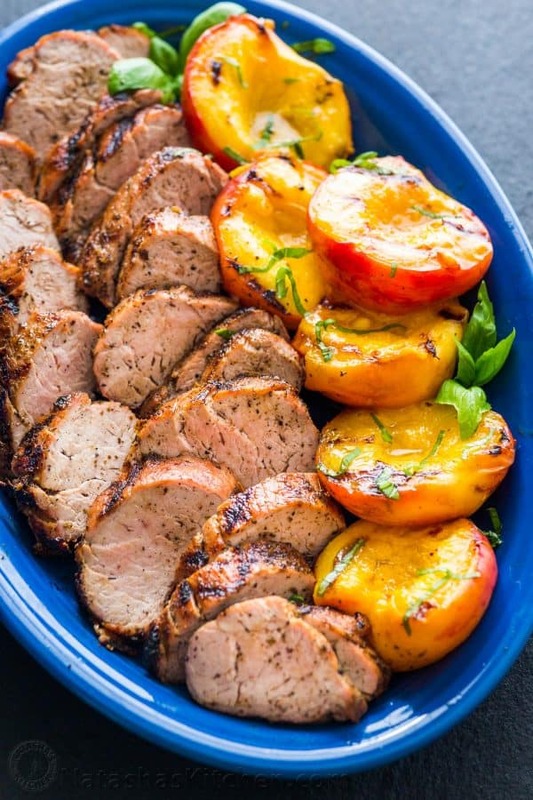 We love pork tenderloin recipes; flavorful, inexpensive and no marinating required. 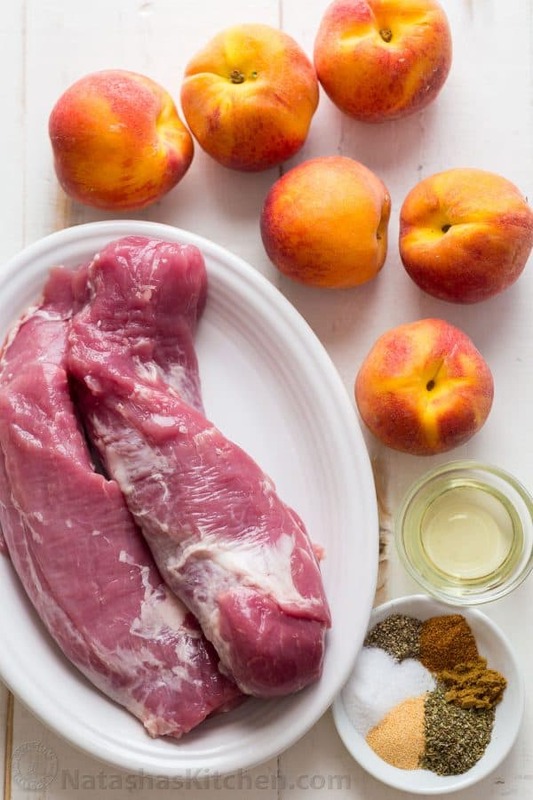 Grilling peaches amplifies their natural flavors and makes this meal feel fancy with little effort! 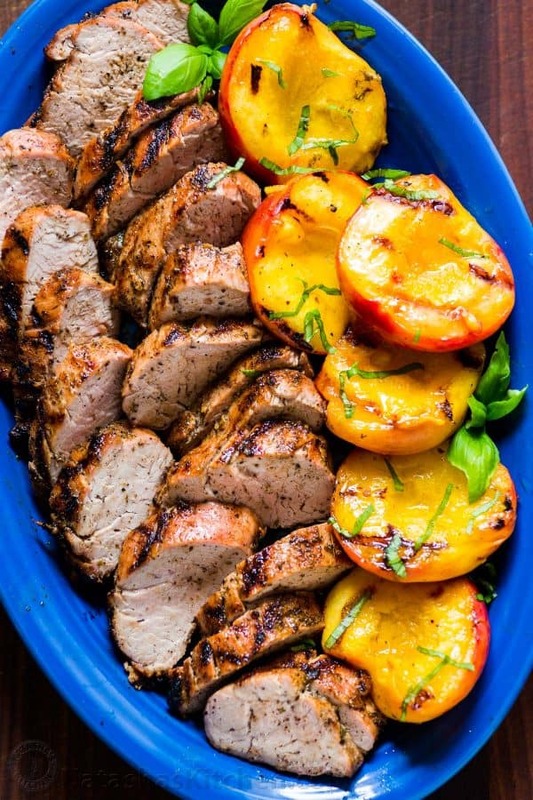 See our secret to preparing a tasty grilled pork tenderloin without marinating ahead of time! This is a 30-minute meal from start to finish including grilled peaches! We included our Amazon affiliate links below to our favorite tools used to make this recipe. We purchase our pork tenderloin at Costco. 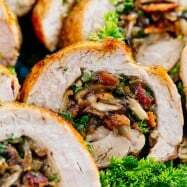 They seem to have the best pricing and the meat is consistently great quality – they come in large packs of 4 total and each pork tenderloin comes out to about $5 which is so reasonable, especially if you are cooking for a crowd. What is a Pork Tenderloin? It is smaller and thinner usually 1 to 1 1/2 lbs each. 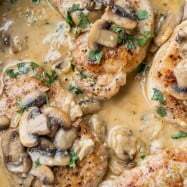 Also known as pork tender or pork filet. Pork tenderloin is best cooked quickly over higher heat. 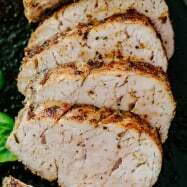 It is more forgiving and you can even overcook it a little and it will still be juicy, which is why we used it for this grilled pork tenderloin recipe. Silver skin must be removed from pork tenderloin before cooking (see tutorial below). What is a Pork Loin? It is larger and thicker weighing 2 to 5 lbs. It is also known as pork loin roast or center cut pork loin roast. pork loin is best cooked slower on lower heat. Both cuts are lean but their shapes and sizes are very different, so they should NOT be substituted in recipes. 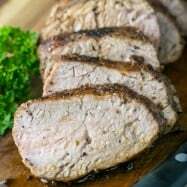 For the most tender, flavorful and easy to chew results, you must first remove the white membrane known as “silver skin” from the pork tenderloin. If not removed, the silver skin can be tough and chewy once cooked. To Remove Silver Skin: Insert the tip of your knife between the silver skin and meat and slide your knife along the meat while pulling the silver skin and fat away at the same time. 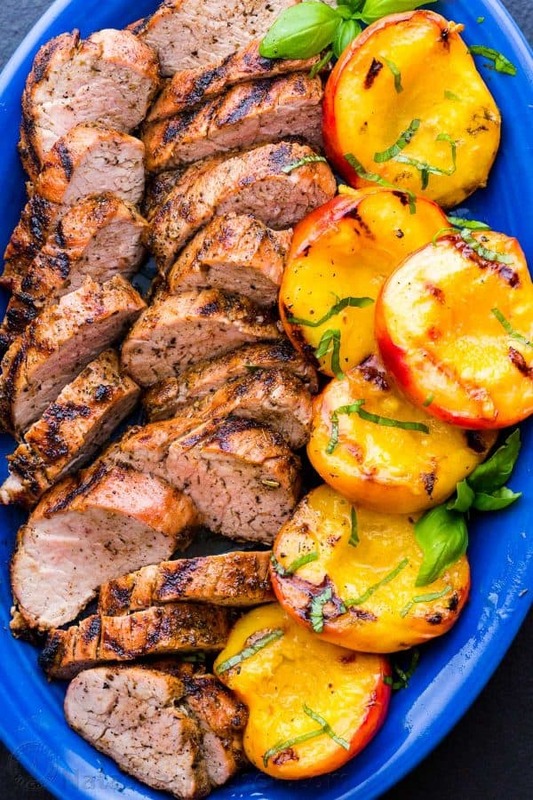 Peaches are the easiest fruit to grill because they don’t need any glaze or seasoning. They become so juicy and just explode with flavor. How to Pit Peaches: Ripe locally grown peaches are the easiest to pit. Slice the peach all around starting at the stem and coming back to it. Twist both halves of the peaches. and one side should end up pitted. Run a pairing knife around the top and bottom of the pit and wiggle it around until it pops off. How to Grill Peaches: brush both sides with olive oil and place on a clean preheated grill for 4-5 minutes per side over medium heat (300˚F). Now you know! 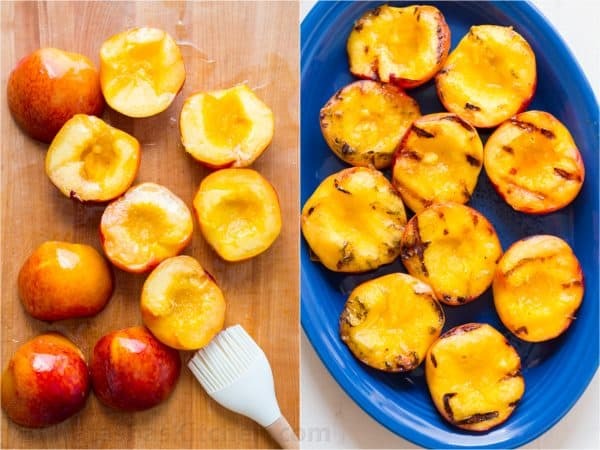 Are you surprised how easy it is to make grilled peaches? Grilled pork tenderloin really is as juicy as it looks. We love that it’s lean and juicy – there is no need to pick at it once it’s on your plate – the best!! Pork Meatballs with a secret ingredient! Grilled Pork Tenderloin is juicy tender and delicious! 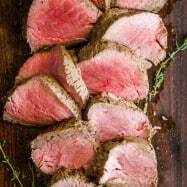 We love pork tenderloin recipes; flavorful, inexpensive and no marinating required. 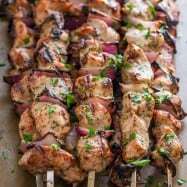 Grilling amplifies their natural flavors and makes this meal feel super fancy with hardly any effort! Trim off and remove silver skin from pork tenderloins. Poke all over with fork. Drizzle with 1 1/2 Tbsp oil. Combine seasonings and rub all over pork tenderloins. Preheat grill to med/high heat (400-425˚F) and grill pork 7 min per side or until center reaches 145˚F then remove to cutting board and rest 5 minutes prior to slicing. Set the grill to medium heat (300˚F) and clean the grates with a grill brush. Brush each side of peach haves with olive oil. Grill each side 4-5 minutes (**depending on ripeness) or until grill marks form. Remove to platter with pork tenderloin and garnish both with fresh basil leaves. **Grill very ripe peaches 4 min per side and less ripe peaches 5 min per side. Can this be cooked in the oven and if so what temp and how long. Some places have high burn days if you live around the mountains and can’t grill outside. that is going to be my family dinner.